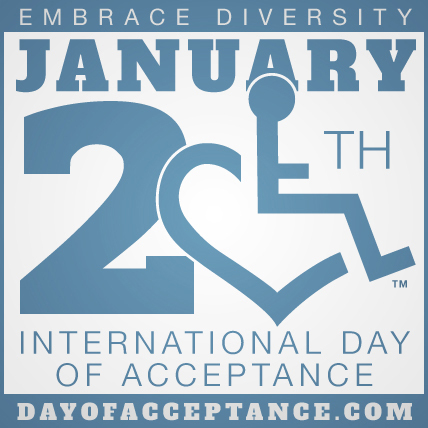 I'm a little late with this post, but I just learned that January 20 is actually "International Day of Acceptance" - a day dedicated to the social acceptance of disability. You can check out the website here to learn more about this day and Annie Hopkins, the woman who started this movement. What stuck out to me, right away, was the focus on social acceptance of disability. I've been thinking a lot about this lately - about disability's intersection with the diversity and inclusion movement going on right now, and about how willing society really is to have a conversation about disability acceptance. There's a movie out right now called "The Upside," where Bryan Cranston is playing a quadriplegic. And at first, you think - "Great! It's really cool to see movies about people with disabilities being made." The problem is, though, that they're not actually hiring actors with disabilities to play those roles. They're hiring able-bodied actors, many of whom go on to win awards for taking on such "difficult" roles - the roles that are essentially the lives that people with disabilities have every day. Hollywood has a real problem with disability. They certainly don't hire people with disabilities to play characters without disabilities, but then they also don't cast them to play characters with disabilities when those very, very few roles appear. So we don't see any actors with disabilities on our screens, ever. There are a few great exceptions - Shannon DeVido on "Difficult People" (which I talk about here), R.J. Mitte (acting opposite Bryan Cranston himself!) in "Breaking Bad," and a few others. But they're incredibly few and extremely far-between. And it's not just Hollywood - it's society as a whole. Trevor Noah did a great segment on the Bryan Cranston casting controversy - watch it here. And then, if you're feeling brave, take a look at the comments. The majority of people just do not get it - and don't really want to. There are still lots of people who are incredibly comfortable with others with disabilities... if they don't have to see them, or interact with them. I know this is a bit of "preaching to the choir" here because many of you know me personally, and are comfortable with me, disability and all. But I think it's a good reminder that not everyone feels the same way. That's why I think that the goal behind the International Day of Acceptance is so important. We have a long way to go until we truly have social acceptance of disability, and I'll gladly support anything working to get us there.